"Be A Master® of Psychic Energy" by Dr. Theododors Kousouli awakens the untapped power inside that can heal, increase intuition, or give genius insight! 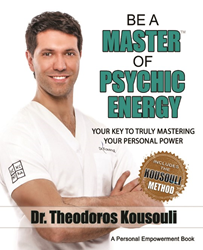 In his latest book “Be A Master® of Psychic Energy”, Dr. Kousouli takes readers beyond this earthly dimension and uncovers the secret working of energy, healing, prayer, meditation, and supernatural abilities. The POWER of the MIND can do incredible things! Why do so many doubt their inner power? Dr. Kousouli also discusses how the miraculous healings of one of history’s most influential icons, Jesus of Nazareth, may have been done – and how similar innate laws of healing can be manifested via your nervous system. Do humans have untapped abilities that can be brought forth to heal, increase intuition, or gain genius insight? If each human is gifted with co-creator genes, is humanity ready to fully manifest this power? Dr. Theo Kousouli is a leading mind-body holistic healer who is changing the landscape in his field. He is a Board Certified Doctor of Chiropractic (spinal specialist), a hypnotherapist, and best-selling author of 8 life-changing books. As a personal transformation coach, Dr. Kousouli has advised entertainers, business leaders, energy healers and spiritual seekers of all varieties using the Kousouli® Method. His professional and spiritual path is a direct result of overcoming family, health and medical misfortunes as a young man.